Beloved Zagin has opened a new shop! I made it my business to find an excuse to stop there as soon as I could. While this shop specializes in sardine ramen, I didn't realize that at the time and couldn't help myself from going with their fantastic chicken again, this time in tsukemen form. The soup was a frothy, milky chicken with a nice ginger sweetness. The noodles were fat, and coated themselves with the smooth substance. Just like the ramen, the tsukemen was loaded with interesting toppings. 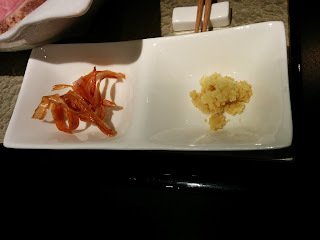 There was a crispy piece of potato, a sweet almost honeyed piece of pork, and a few small slices of chicken seasoned with yuzu.